The Egyptian revolution is not just a story about the downfall of a president but the story of a generation – “the shebab,” the Arabic for the youth, who brought it to life. Shouting slogans in Tahrir or hunched over the blueish glow of laptops, arguing online through long evenings about everything from feminism to presidential candidates, this generation’s youth has become bound up with protest in a way unprecedented in the Arab World. This is protest of a new kind, inseparable from the quiet technological re-wiring of a society that has seen the internet warp itself into millions of homes and mobile phones. Computer screens and television have acted as personal periscopes to the world beyond Egypt. This is a generation frustrated by their parents, at their lack of worldliness which left them so long content with the status quo. They are distrustful of their elders, who they view as the creatures of a dictatorship. Yet at the same time it is still, a generation overwhelmingly trapped in the family home. For a traditional country, where only with marriage do you leave home, and you can only marry when you have money – youth unemployment has trapped, infantilized and frustrated the young. This is a generation still in its political innocence, on the verge of being defined by its disappointment. Yet regardless of which of which road the country takes - the currents amongst the youth will not settle back into stagnation. They may be far from free, but it will impossible to defeat young Egypt. Some people say demographics is destiny, and with over 50% of the population aged under 25, it is it is right on their side. 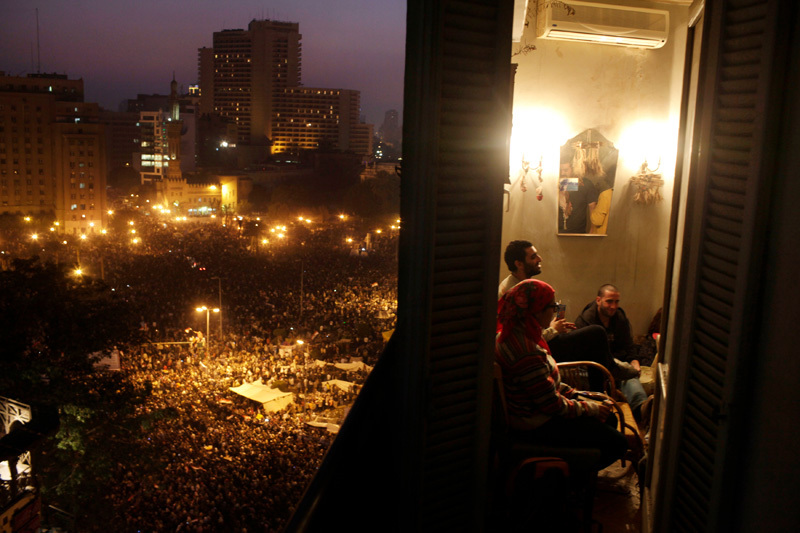 Activists look out from the balcony of an apartment overlooking Tahrir Square in Cairo, Egypt Nov. 21, 2011. Mass protests exploded in Tahrir square after the authorities moved to evict protesters who had encamped themselves in the square the night before. Thousands converged into the square, sparking a battle that is continuing into its fourth day.